The SUNNYARD patio umbrellas create the perfect patio area for your spare time.The design of the patio umbrellas allow for more space under the umbrella, providing maximum protection from the sun.The led patio umbrellas light up the evening during picnics, barbecues, and other events. ideal for relaxing and entertaining in the night.Enjoy the time with your families or friends whenever in daylight or at night. 1.Please close the umbrella when not in use for a longer performance, and it is not recommended to use in bad weather condition. 2.Heavy base is necessary (not included in this item).40lbs (18KG)umbrella base is needed to hold the umbrella safety. 3.Due to the sunlight and the monitor, pictures may have a slight color difference, which is inevitable. 4.If you have any problems after received the market umbrella. Please contact us in time, we will definitely help you solve the problem. ☞Energy-Efficient Lighting: 6 steel rib construction,4 led lights on 4 long ribs .3 led lights on 2 short ribs. The solar powered lights are powered by solar panels which located on the top of the umbrella), the on/off switch of the solar lights located on the handle of the market umbrella. ☞CRANK LIFT SYSTEM :7 by 9 feet led outdoor patio umbrella with the crank and tilt mechanism of this product,you could make the patio solar umbrella easier to open and close and adjust the patio table umbrella to block the sun's rays. ☞UV PROTECTION:The outdoor umbrella is made of 100% polyester fabric,long-Lasting,fade resistant,easy to clean. Led outdoor market umbrella provide more UV protection,the solar patio umbrella is perfect for a bright and sunny day! 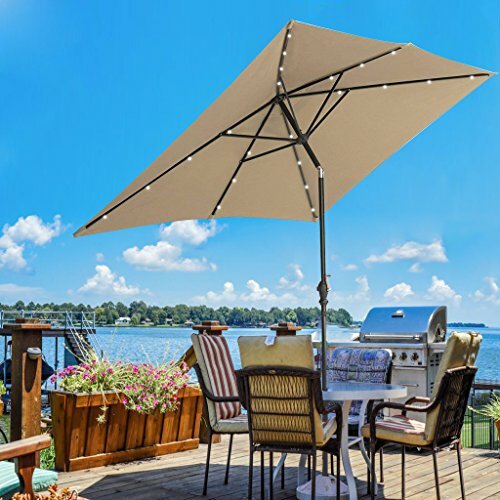 ☞Reasonable frame: 1.5" diameter aluminum center pole and powder coated, 6 durable ribs construction provides superior strength support to the patio umbrella.The air vent at the top to facilitate air flow and reduce wind pressure. ☞Note: The outdoor led patio umbrella does not come with patio umbrella base. When used as free standing umbrella, it needs a 40lb (18KG) patio umbrella base. Fold up in blustery and thunderstorm day. If you have any questions about this product by SUNNYARD, contact us by completing and submitting the form below. If you are looking for a specif part number, please include it with your message.